It was too windy to row, so I did a 75 minute erg workout. 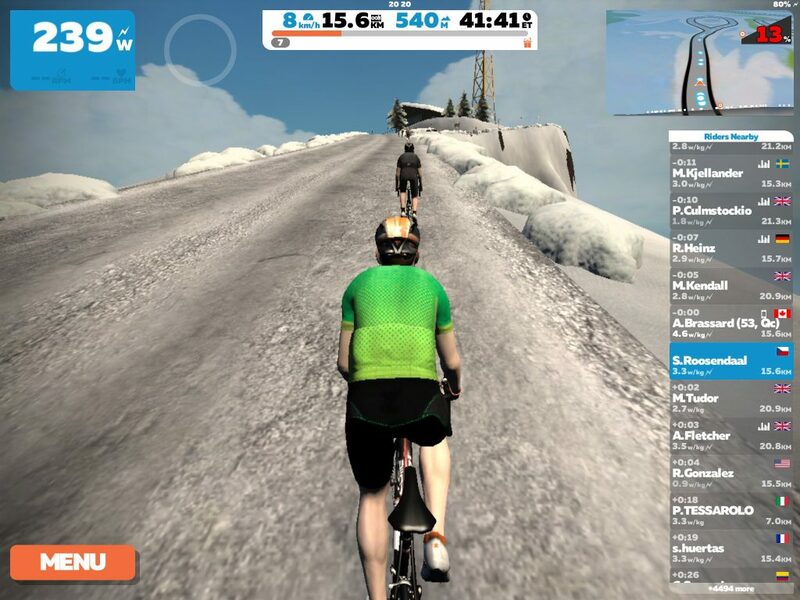 Used Zwift and rode the “hilly course” (or something like that). 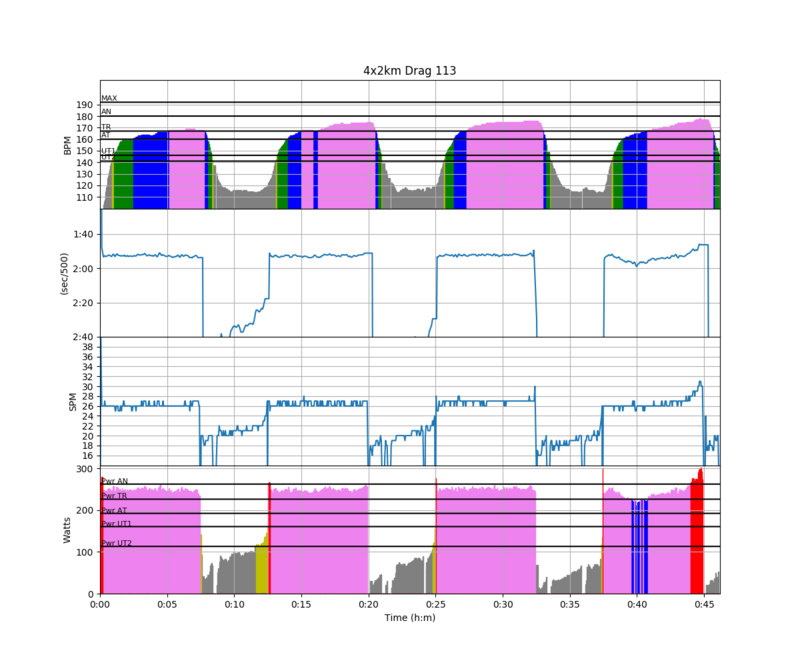 Longer rows with PainSled and Zwift are a bit problematic, data-wise. So you get two charts. Of course we don’t want to win the Primatorky and the Masters Nationals this year, like we did last year. Therefore, we haven’t been on the water in an eight yet. Actually, we aren’t training at all. If we show up at those races, it will be the first time we sit together in a boat. So, today, we didn’t go out with a nearly complete crew and one substitute. 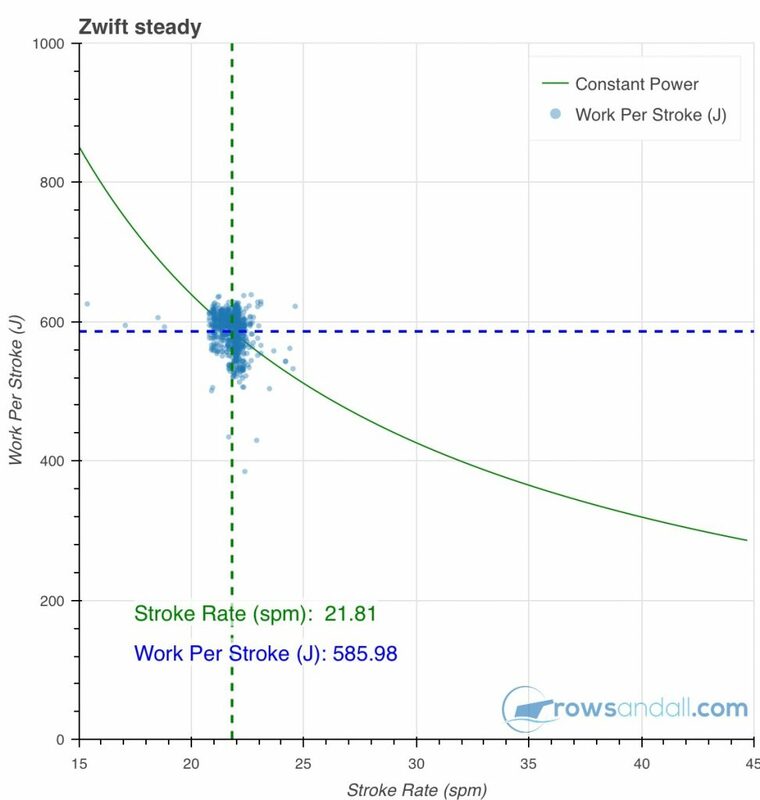 We didn’t work on technique and we didn’t have long discussions on what we should improve in our stroke. We didnt do those technique drills at all and it didn’t come together for s few stretches. The following chart is not from a Masters eight. Our competitors can sleep quietly. 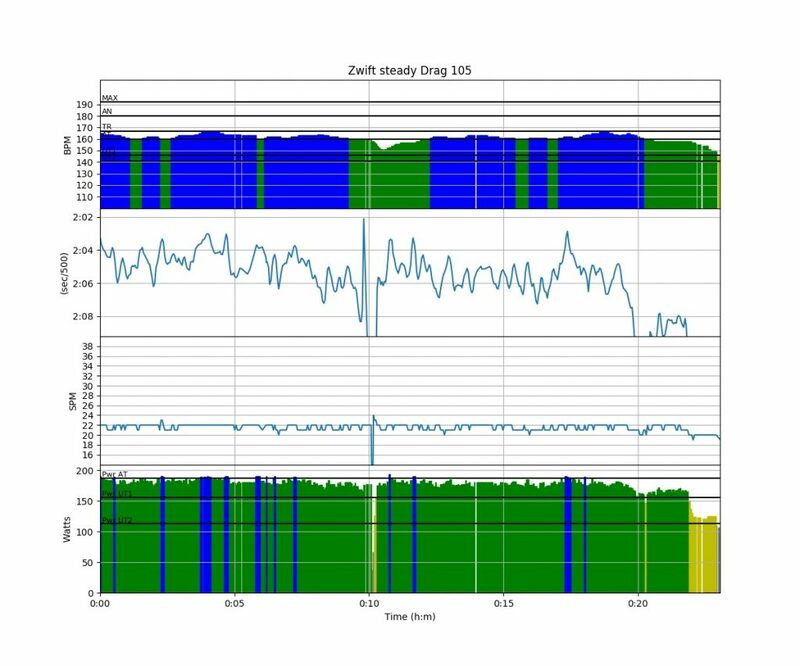 The first 15 minute of this chart is noise because I mounted the mount and started BoatCoach when the boat was in the rack, before we didn’t launch. The Veterans Ladies were missing a fourth person, so they offered me a stroke seat in a quad outing on Sunday afternoon. I was in for a nice, short row, so I gladly accepted. Romana and I arrived early because there was some work to do. First, we put our single and double back on slings. Some experiments on Saturday had revealed that the new tight racks are a bit too tight. The guy who built them used two of the smallest boats as measures and some boats simply don’t fit. Everything has to be disassembled and rebuilt from scratch. Then, I wanted to make sure the quad was in good order. There are a few crews in our club with a habit of cannibalizing club equipment, so in the popular boats you can never be sure you are using the original foot stretchers, sliding seats, and more. The situation was not good. A lot of red C rings were missing under the oarlocks, and the club’s spare part are in Italy with the Juniors and Men on their rowing camp. So I had to take from my own spare parts collection. Also, the stroke seat foot stretcher was not the original one, but I had no way to fix that, and finally some parts of the rudder were missing. The boat was rowable, but it would take a bit more effort for me as a steering stroke to make sure we were going straight. Finally, we launched, and in the mean time the wind had strengthened. It was a few degrees above the freezing point and the waves were pretty strong. After building up from arms only to a full length stroke, I settled on 16 SPM and we tried to steady the balance on waves, in a blazing tailwind, at this low stroke rate. I love these kind of challenges, and I think it really helped us rowing technically well, when we went in to the narrow twisty bit of the gorge at the north end of our lake. The idea was to find quiet water, and we did. It was nice to find out I could still toe steer a quad blindly through the narrow twisty bit. With a slow turning boat you have to make sure you are a little “higher” going into a turn, and I managed pretty well, relying on our bow seat to be on the lookout for any traffic or obstacles. Out of the twisty part, we were all glad and looking forward for the straight kilometer, and I guess our bow seat reduced the frequency of looking. In fact, it was me who spotted the ice first, and very late. We made an emergency stop, breaking ice with our blades and boat, turning the river into a huge black field looking like a gigantic glass of Coke with ice cubes. We backed out of our Coke with ice, then turned the boat, and headed back for the lake. The wind had gotten stronger, a head wind now, and we were slow in making progress. When we were half way the lake, our 2 seat asked that we Row back to the club. I didn’t blame her, because through the waves, she and bow seat were wet from head to toe from splashes of icy water. We returned safe and put the boat in slings for s thorough inspection. Luckily, no scratches or anything from our ice breaking adventure. We did mention the ice in our incident report but the bit about missing boat parts was longer. I am typing this from a British Airways flight from Vienna to Heathrow, where I will board a plane to Phoenix, Arizona. With no holder for a SpeedCoach and classical riggers on this quad, I decided to use the BoatCoach Android app on my waterproof Samsung phone. This works perfectly with the RAM mount and BoatCoach has a splash guard mode preventing splashes to accidentally activate the touch screen. After working through a few data related bugs with the BoatCoach developer last fall, this app is pretty good for recording and showing stroke rate. I still think the user interface is overly complex, though. Using the app for the first time after a few months, I wasn’t sure if I was recording the outing at all, or if the app only recorded the data after starting a “piece”. As I hate having my crew waiting for me fiddling with menus and settings, I just kept the settings as is and hoped for the best. 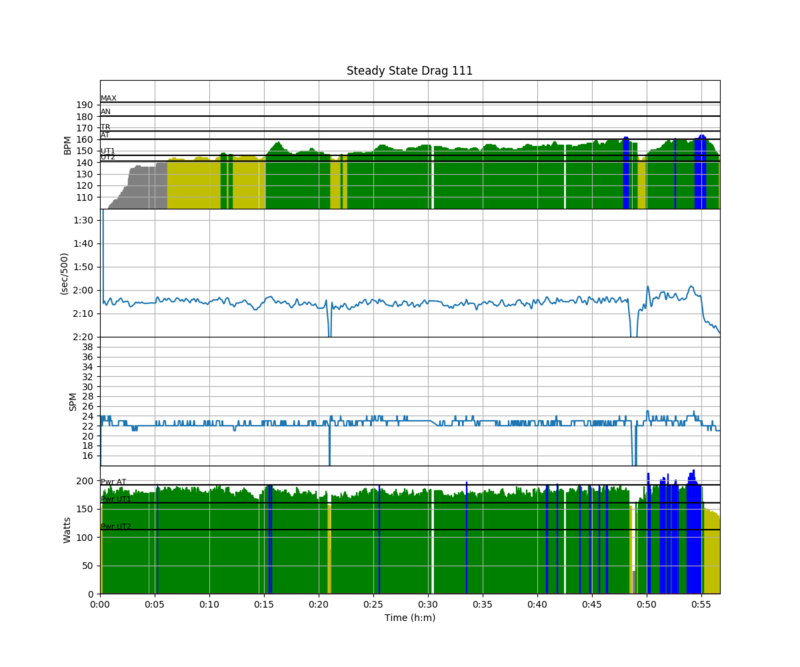 As a backup, I also recorded position and heart rate with the Garmin Forerunner watch. 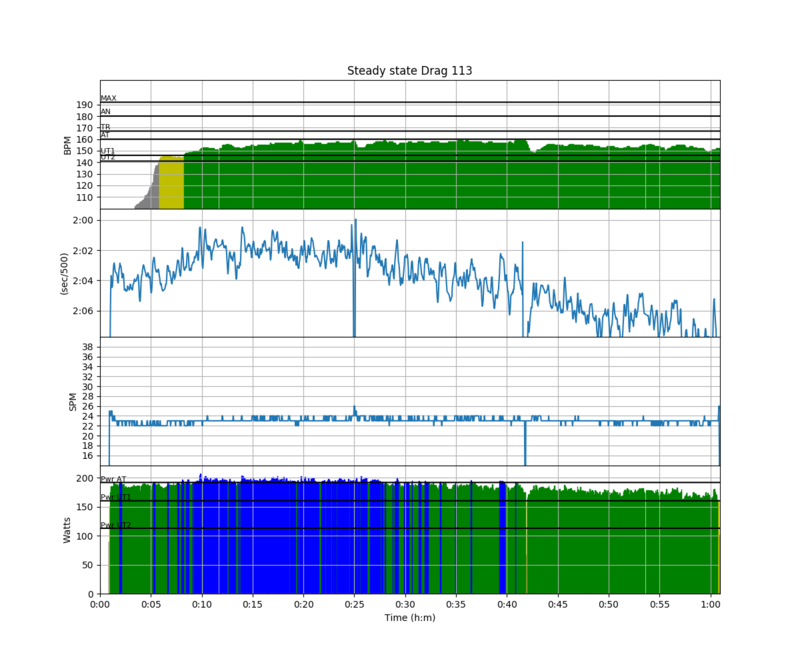 This connects to my Wahoo Tickr X heart rate belt through the ANT+ protocol. 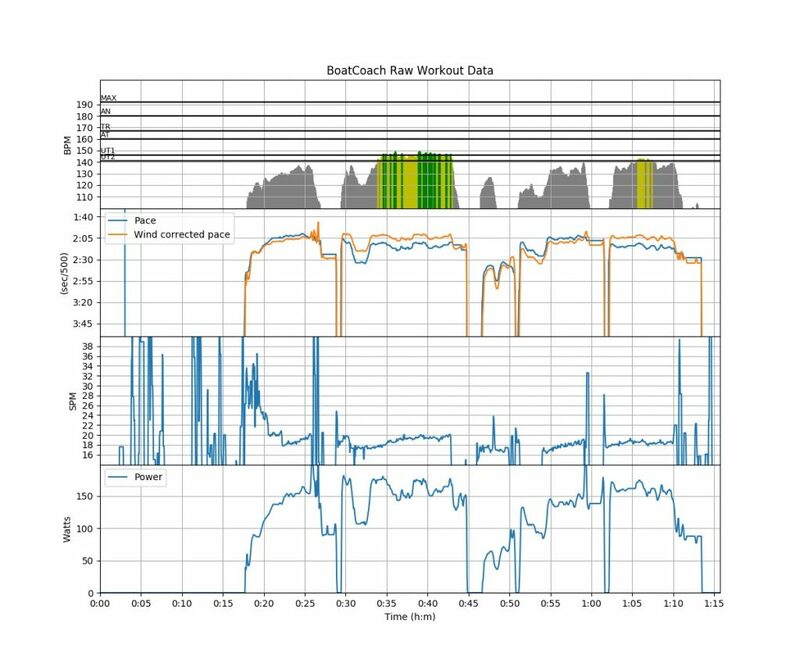 I was glad I did, because it turns out the BoatCoach app hadn’t connected with the BLE channel of the heart rate belt. 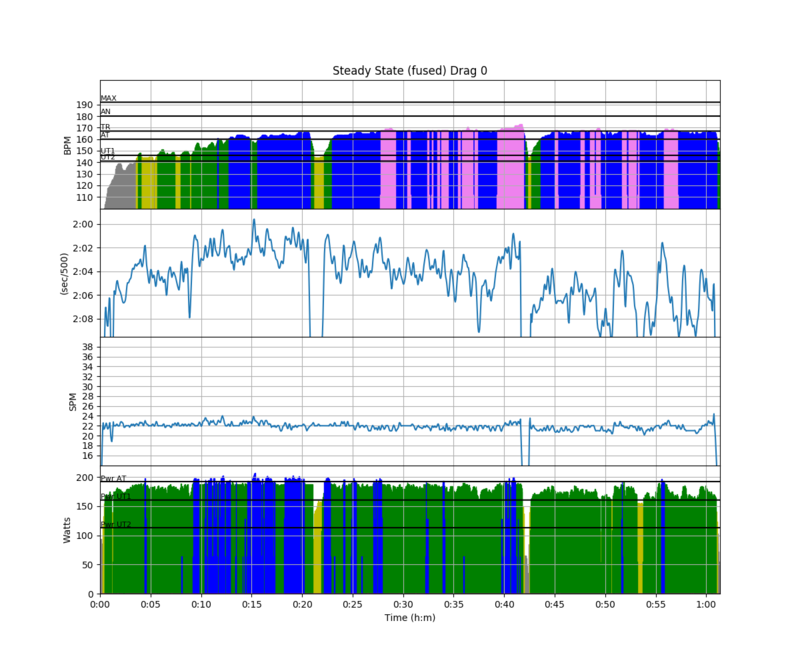 So I ended up uploading two separate data sets to Rowsandall.com and then using Data Fusion to merge them. 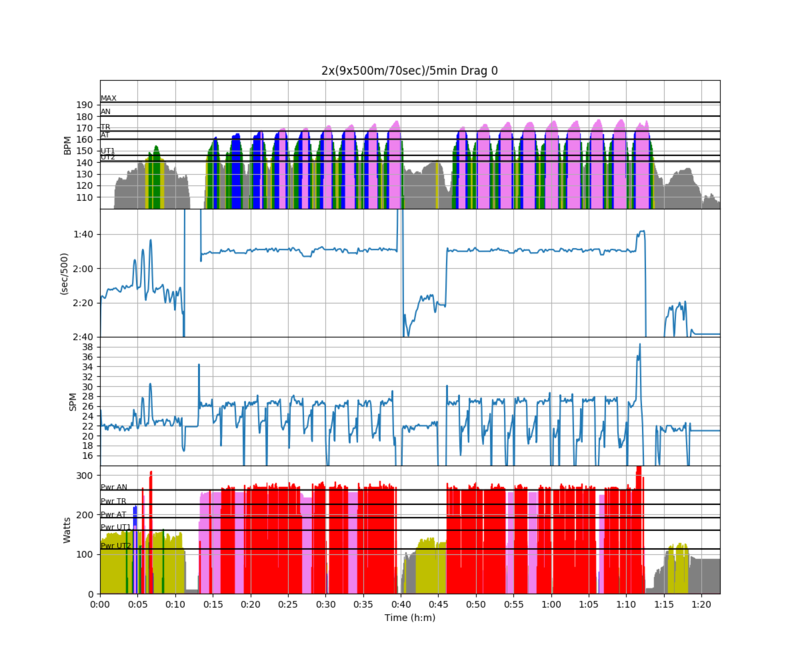 The power data were calculated using Rowsandall.com’s Physics Module. For this to work well, you need to input wind (strong today) and current (not applicable to this row), set the boat type correctly and estimate the average crew weight. If you get all this right, the Physics Module does a pretty good job at estimating power from boat speed and stroke rate. It is accurate enough to get a good value for the average and normalized Power, which is currently the most important metric for me on an outing like this. I just use it to get a value for the training load. 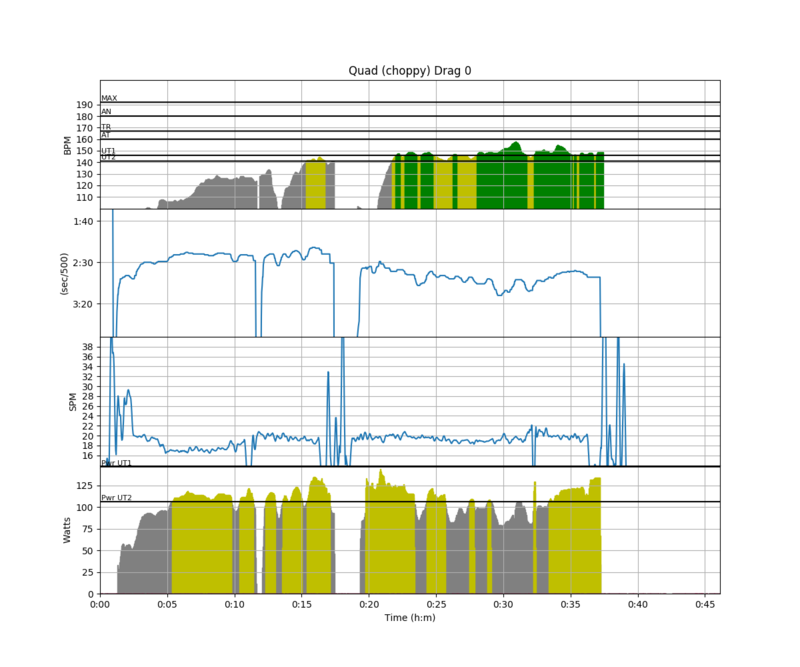 As we rowed only 40 minutes and most of it was well below 20spm, the training load wasn’t very heavy. The twitter feed is full of warnings about snow in the UK, and I am typing these words while having breakfast at Vienna airport, on my way to Helsinki. We had some snow a week ago, but what wasn’t cleared away has now changed into an ice cold, white crust of old snow. It was -14 degrees C when I walked to the train station this morning. I have started to row with the door closed. Because our house is built into a slope, the erg room in the basement has a door leading to the outside. I normally have this door wide open, but on Tuesday evening I left it closed. This makes erging a bit claustrophobic, but it was simply too cold in my untested basement. On Monday I did a lazy hour of swimming in the morning, needing s light training after Sunday’s quite intensive one. Tuesday was steady state erg day. I did just under an hour at very moderate intensities. I also did get a new card in the mail. 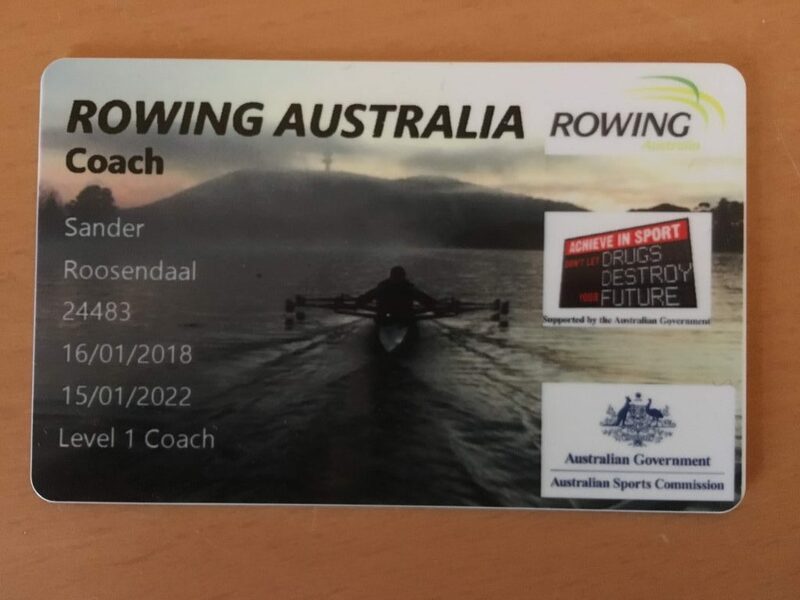 Just being curious, I signed up and completed the Rowing Australia coaching course, including a “community coaching” training which was not focused on rowing. I liked it. It was a good refresher. The basics of learning to row haven’t changed since I learned how to teach rowing when I was 17. What has changed a lot is the emphasis on making sure the child agrees with what you are doing, for example when correcting someone’s body position. This is a good thing. Saturday wasn’t hard, just a normal hour of steady state. This was the hard day. I rowed this with Romana in the erg room of our rowing club. It was a great sunny day, just a little cold. Maximum temperature -7 degrees C and below -15 during the night. I had to Row this with sunglasses because the sun was shining in my face. With Romana, we agreed to replace the 500m with a time based interval of 1:50 duration. This would allow us to Row this next to each other in the same stroke rate. Unfortunately, it was only during the workout Execution that we thought of rowing this on slides as a double, two ergs behind each other. Next time. Romana confirmed my suspicions that she is in great form to break 8 minutes. 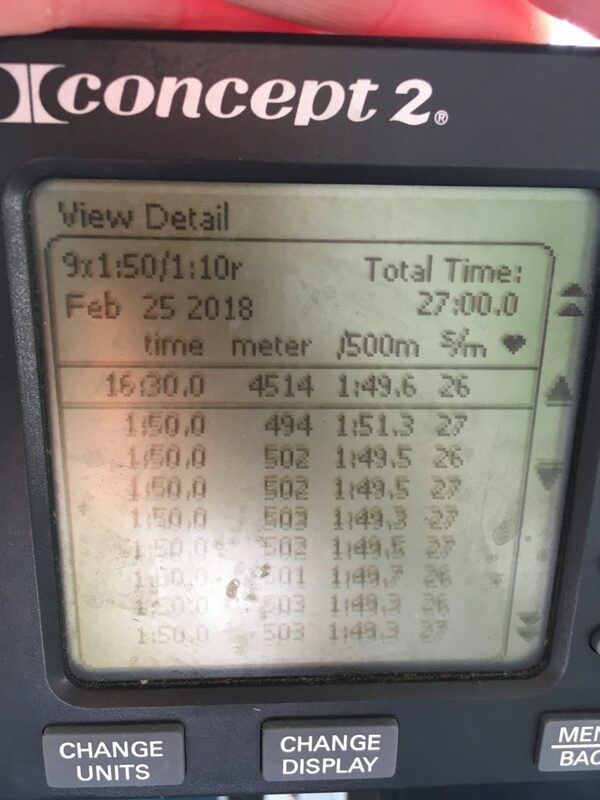 I managed to row each interval above 500m. I looked up my previous average time for the 4x2k and it was 1:51.9 pace in December. I decided to target 1:52 split, but I knew it was going to be hard, after a pretty exhausting day at work. 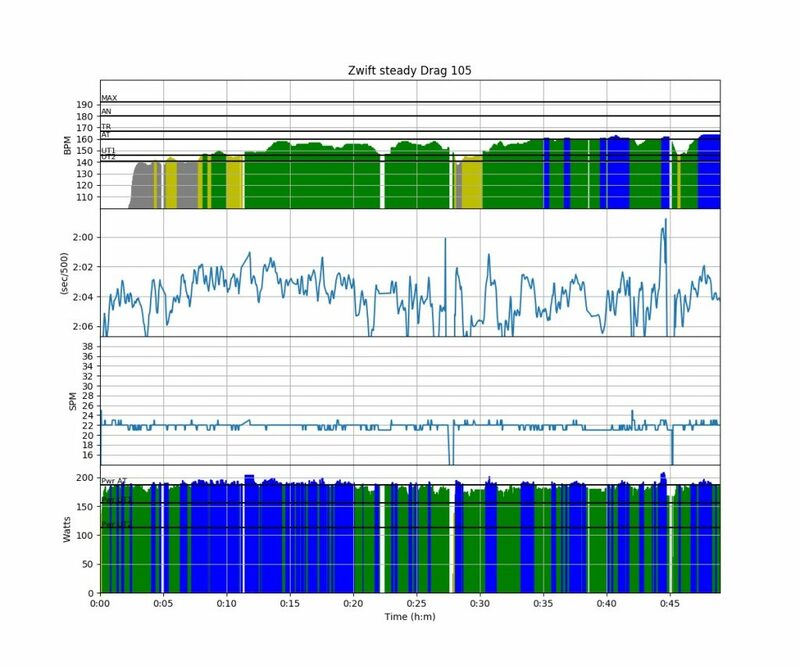 Warming up with some speed bursts at 24, 28 and 30 SPM. In the first interval, I managed 1:52.1 but I felt I should slow down a bit. 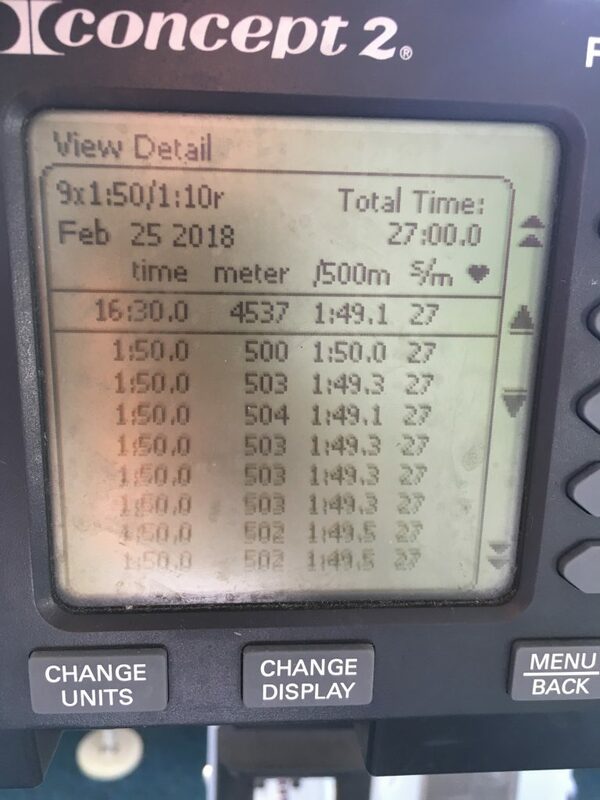 I started the second interval relaxed at 1:53 but as I got into it, and by focusing on good technique, I managed to bring down the average split in the second half of this 2k, and scored another 1:52.1. In the third interval, I focused on sitting straight and only pushing with the legs in the first half of the drive. I also played some mind games, alternating focus between the next 250 marker or the next full minute, whichever came first. In the beginning of the 2k, these two things happen a few seconds apart, but as you continue, the gap becomes wider, and you end the row with something to row towards every 30 seconds. This worked so well that I managed a 1:51.8 split. Much better than expected (I was expecting to fight handle down demons). I paid for it in the beginning of the final, fourth interval. I had somehow drained my mental energy in that third interval, and suddenly I was looking at 1:56 and 1:57 splits and unable to lower them. The fact that this is pure mental was proven as I passed the 1000m mark. I was focusing again on the next full minute or 250m marker, and suddenly the splits started coming back to the desired values. I kept gradually lowering them and with 250m to go I rated up to 30spm and 1:45 pace to try and bring the total time under 7:30. I missed that target by a second. Given the exhausting working day and the fact that I am not feeling 100%, I am happy with the result. At the rowing club. Sat down on the erg. Started pulling. Had some water after 5 and after 10 kilometers. Martin on the erg next to me was pulling a 1:54 steady state pace. I rowed a large part of this with eyes closed, because the sun was shining into the erg room. The lake view was nice for a change, but a little too much ice on the lake to my taste. In total we were 5 rowers doing steady state, and most of the time we rowed in sync. It was nice. Earlier on Sunday, I watched Sven Kramer win the 5k long track speed skating at the Winter Olympics. That was a great event to watch.